Part of the Passport To The World film festival, April 11, Tourism Ireland hosted the premier of Ireland: Emerald Island, now playing in 23 theatres across Canada. The feature-length film takes viewers on a delightful tour around Ireland highlighting popular tourist hot spots like Temple Bar, lesser known gems like Russborough House, and newer attractions like the Titanic Belfast experience. For more visit www.ireland.com. 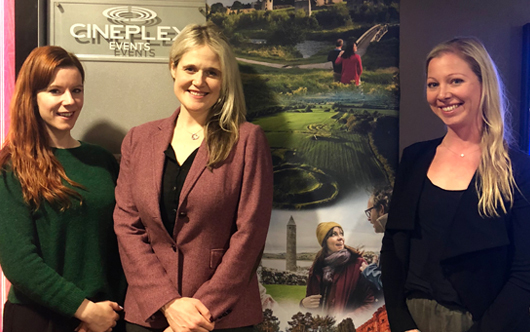 Pictured (l-r) are Sandra Moffatt, trade and digital executive, Tourism Ireland; Dana Welch, manager – Canada, Tourism Ireland; and Jocelyn Black, publicity executive, Tourism Ireland.